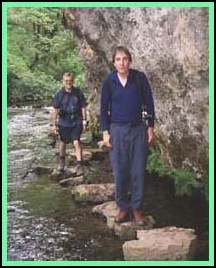 It was a beautiful summer’s day in 2000 when Mick, Larry and I decided to have a little potter around Chee Dale and Millers Dale. It was left to me to come up with a suitable walk with the hard bits in the morning, the easy bits in the afternoon and a pub in the middle. We had decided to park Mick’s Car at Millers Dale Station Car Park. This, initially, was a little bit upsetting for Mick who detests having to pay for parking. However, public conveniences were nearby and, as it had been almost two hours since we had left Warwickshire, Larry and I quickly found the coinage for parking fees and without more ado made a B line to the Loos. The walk today was initially to take us up the big hill on the other side of the River Wye (to the south of the station). 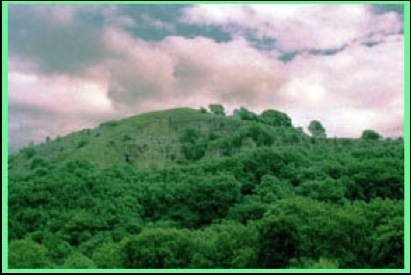 Mick and I had both ascended it when we completed the Peak District Challenge earlier in the year. When we tackled it then we were about 16 miles into the walk and this bit had been the hardest part of the whole "ordeal". Today we expected it to be easier, as we would be "fresh", but it would still be the stiffest "climb" of this day. We took a route slightly east of the one Mick and I had used previously which meant we walked along the old Monsal Railway track, over the river, and resulted in us starting higher up than we had the two or three months earlier. It was very pleasant walking up the wooded slopes but I certainly was relieved to cross over that final stile that took us out of the wood and across the fields to Priestcliffe. From Priestcliffe, with the sun shining on our faces we walked along the lanes and crossed the A6 to reach Taddington. 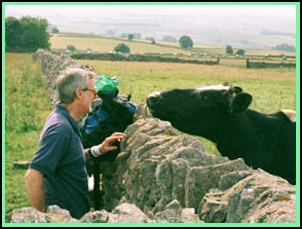 As the first check point on the White Peak Walk is slightly to the west of Taddington, we were all aware of the village. However, it was the first time we had visited it and very nice it looked too. Just tucked away from the busy A6, only a few miles from both Buxton and Bakewell, it looked idyllic as we wandered through it in the mid morning sunshine which was getting warmer all the time. Or was it because I was getting warmer as we went up hill looking for a path on the right that would take us across the fields to Chelmorton and lunch. We found the path and more uphill work took us to near the reservoir at Sough Top where we enjoyed "elevenses" while a group of cows grazed in the next field adjacent to the stile we had to negotiate to continue our trek. They soon moved when we started to climb over it but as the field the other side was full of their relations Larry, who would rather not be in close proximity to cows, made sure that either Mick or I were always between him and the cattle. He will deny this but Mick and I know the truth. Cattle behind us, Larry in front, we wandered through the fields, crossing the Limestone Way as we dawdled along the path to Chelmorton. Yes, I know it seems strange us dawdling when a pub is probably less than a mile away, but we had made good time that morning and realised we would probably arrive at the "oasis" before noon, and opening time. We did, so we had a look at the village, which at 1200 feet above sea level is the highest village in Derbyshire. No wonder it seemed most the morning had been spent going uphill - it had. This is where Larry fell in love. I don’t know the lady’s name but while Mick and I were in the Church Inn drooling over our Yorkshire Pudding, mashed potatoes and sausages, Larry was drooling over the barmaid. Well maybe not drooling, but at least panting a lot. He blamed it on the heat but as we were in the shade of the bar with pints of cool beer in front of us Mick and I considered he was affected by something more feminine. Needless to say under the persuasion of Larry we stayed longer there than we had intended, certainly eaten a more than adequate lunch, and done more than just quench our thirst, so it was certainly with effort that we said farewell to the hostelry and continued our journey. Fortunately within 10 minutes Larry had got over being lovesick, but I do know that he has revisited the pub! !The sun was now really "doing its stuff" but most of our route was now downhill, or on the flat, so, although the afternoon’s ramble would be longer, minimal ascending would make it comparatively easy. Continuing in a general westerly direction we soon reached the southern end of Horseshoe Dale, which continues north to become the wider Deep Dale. This area reminds me of the upper reaches of Lathkill Dale. 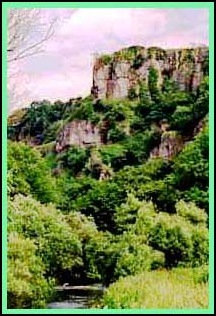 It has the same rugged splendour and even the same vegetation with orchids overing the steep slopes. It also reminded me of an American "cowboy" Canyon and one half expected to see the Apaches on the skyline, bows and arrows at the ready to ambush the Palefaces travelling below. The romantic in me was coming out or was it because I’d had too much beer and too much sun? 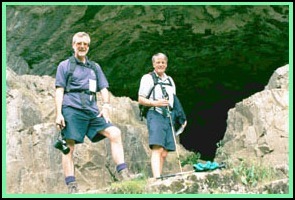 Soon we were in Deep Dale and visited a large cave on the eastern slope and took a short break before continuing north. When I’m driving my car I hate it when other drivers want to get in my "boot" and I will often move over to let them pass, rather than hold them up, particularly if I want to motor along slowly and enjoy the countryside. Similarly when I am walking, if the path is narrow and some one wants to pass me, I "pull over", and let them pass. 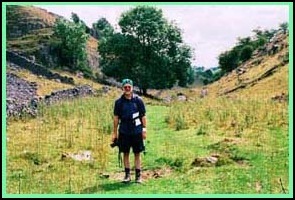 Now the path at the bottom of Deep Dale gets very narrow and we came upon three walkers going considerably slower than we were but would they move over and let us pass? No way. We must have followed them for well over a quarter of a mile before they decided to stop and let us overtake. Hooray. Now we could go at our pace, which was a lot easier than going slowly at theirs. Soon we neared the mouth of Deep Dale and Topley Pike Quarry. What a mess. How ugly. It is difficult to believe the beauty of the top end of the dale when you reach its junction with the A6. I remember walking past a lagoon full of some awful looking liquid and passing spoil heaps. We didn’t spend time here but quickly crossed to the north side of the road, through the car park and along the path that would lead us to Wye Dale, Chee Dale and Millers Dale. We were all looking forward to this. 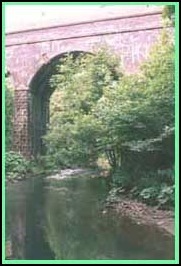 The path took us through shady vegetation close to the Wye, under tall bridges that trains would have used on their journey from Bakewell to Buxton before we crossed to the north bank of the river near Mosley Farm and the beginning of Chee Dale. Here the path followed close to the river on our right with the almost vertical cliffs of the dale gradually steepening on our left. Soon the distance between the two became so narrow that the path took to the river and we continued downstream on slabs of concrete that had been conveniently placed on the river bed to act as stepping stones. With the river low and sluggish it was a very easy stroll on the "stones" through this part of the river gorge. Back on land the path resumed until another bridge was crossed to the south bank. 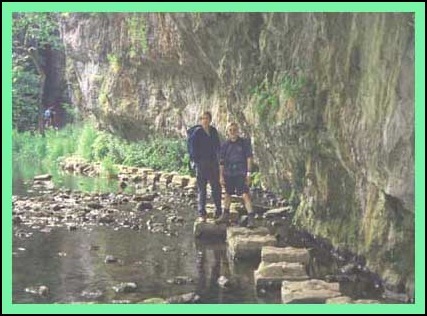 - here the river was too deep for stepping stones and the north side of the gorge too steep to accommodate a path. We crossed the bridge but, rather than continue downstream on the south bank, we took a short detour that took us to the abandoned railway bridge that crossed the river a short distance further downstream. Here were super views down into the gorge and the river. It must have been a wonderful experience to have travelled on this railway through such wonderful scenery. Retracing our steps back down to the river, we rejoined the downstream path which soon took us over our third footbridge over the Wye and, as the path again narrowed, we came to the proper stepping stones. Today, unlike the last time I had been here there was no rising river and no nervous female travelling at a snail pace over the stones. The water was clear, the "stones" were high in the water. We all enjoyed this part of our stroll and it was an ideal location for a few photos. The gorge continued and in parts we walked under overhanging rocks. These would have been very useful if it had rained, but the shade of them was cool and pleasant today. The next main landmark was a stream entering the Wye from the north, which we crossed via a small wooden bridge. Soon we reached an area with wider banks and a footbridge that transported us to the fields that had materialised on the south bank. From here a short walk south-east brought us to another part of the old railway track. A turn left took us over another old railway bridge, which is now often used, for absailing to the riverbank below. Mick informed us that some years ago he had partaken in this activity from this bridge. Neither Larry or I were keen to have a go. We hadn’t got the equipment anyway. 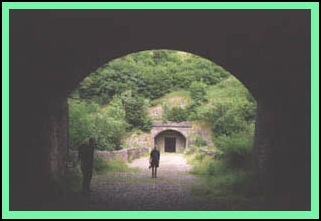 So we continued along the railway track – the Monsal Trail - at a leisurely pace and soon reached Millers Dale Car Park and the starting point for our trip home.